This sweet and savory appetizer combines black raspberries with goat cheese and a vinaigrette, served on a red leaf lettuce-topped round of hearty bread, and sprinkled with pistachios for crunch. I need other women in my life. Women nurture me (and I hope I nurture them in return) via online interactions and in person. While I love my spouse and my kids, the support I get from my friends bolsters me in other, very necessary, ways. So to my female readers of all ages: keep supportive friends in your life. Call to deliver birthday greetings to your college buddy when she turns 85. Have lunch with your sidekick who's moving back home after a job/relationship didn't work out. Chat online with your alter ego who needs a listening ear and some motivation. Take a walk with your pal who's having trouble figuring out the chemistry homework. 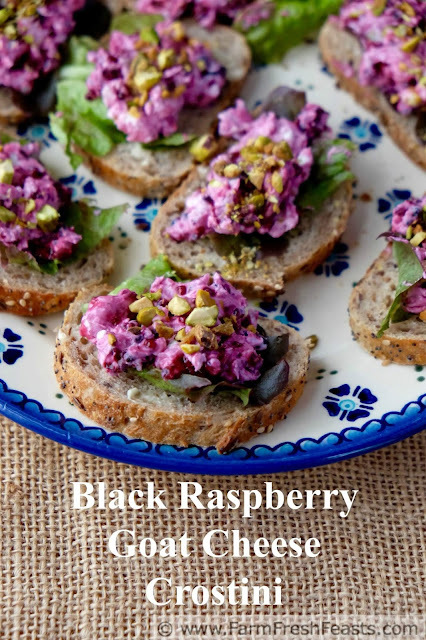 This appetizer is one that I brought to a gathering of women who nourish me: my book group. We meet once a month and discuss a wide variety of books as well as an even wider variety of other topics. Unlike other groups I've been in, there's not typically a food component to our meetings. If no one feels like hosting, we meet at a local coffee shop. 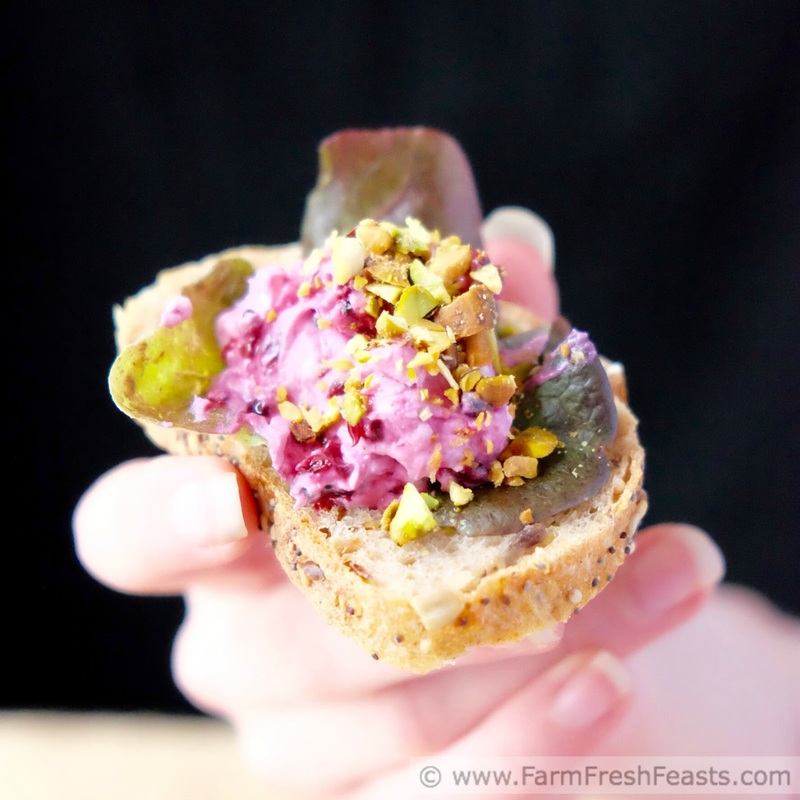 No pressure to produce an elaborate spread--we just want to get together. 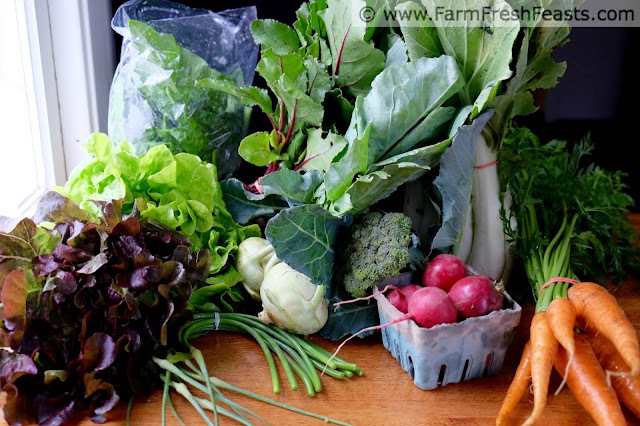 A typical Spring farm share box--plenty of greens and cool weather crops. 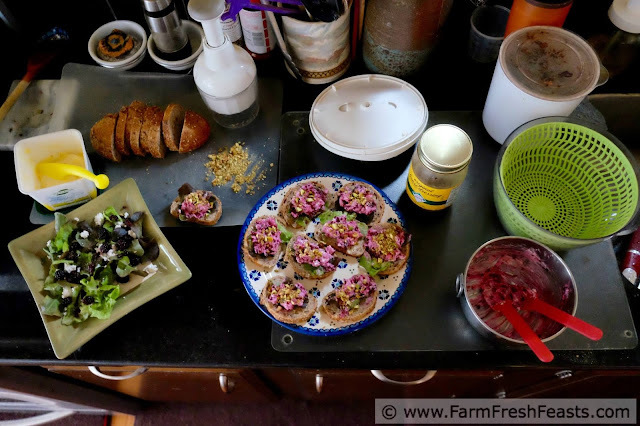 I liked the taste of the Black Raspberry, Goat Cheese and Pistachio Salad I made with the Spring Community Supported Agriculture (CSA) farm share lettuces, and decided I wanted to use that combination in a handheld appetizer. 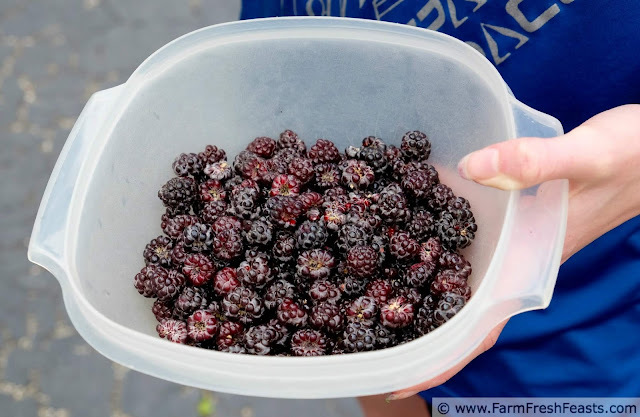 My daughter harvested plenty of black raspberries from our patch so I didn't need to skimp. 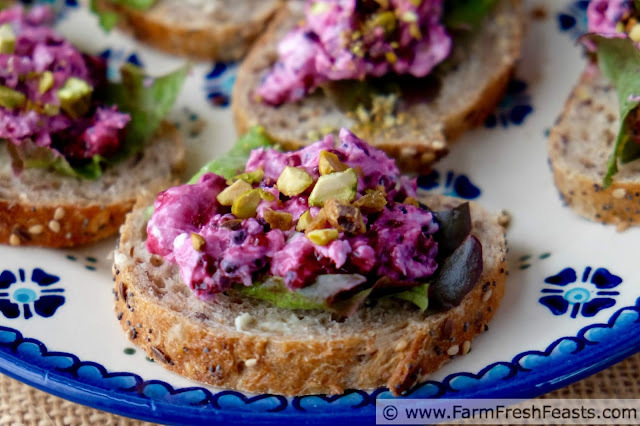 The pistachios provided a nice crunchy contrast to the creamy goat cheese, and the pink color was perfect for a ladies' gathering. 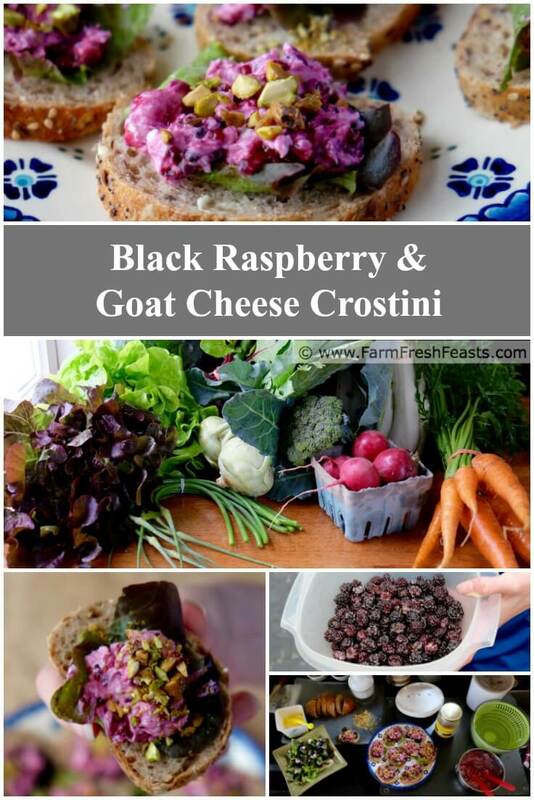 In a medium bowl, combine goat cheese and raspberries until raspberries are mashed. Mix in salad dressing and a couple of grinds of fresh pepper. Set aside. Toast the bread if you like. I did not, but if you are--preheat an oven to 350 degrees Fahrenheit and lay the bread in a rimmed baking sheet to toast for 5 minutes on one side. To serve, spread a bit of butter onto rounds of bread. Top with a piece of lettuce, a teaspoon or two of raspberry mixture, a hit of freshly ground pepper, and a sprinkle of pistachios.